the Rogersville Water Works & Sewer Board in Lauderdale County. Kevin is a 2018 graduate from Lauderdale County High School with a 3.6 GPA. Kevin is planning to attend Snead State Community College where he is pursuing a Degree in Physical Education. Garrett is the son of Bradley Sanders, Assistant Manager for the Odenville Utilities Board in St. Clair County. Garrett is a 2018 graduate from St. Clair County High School with a 3.9 GPA. Garrett is planning to attend Birmingham Southern College where he is pursuing a Degree in Engineering-Teacher..
Reagan is the daughter of Shay Gregory, Office Manager for Loachapoka Water Authority in Lee County. Reagan is a 2018 graduate from Reeltown High School of Tallapoosa County with a 4.0 GPA. Reagan will be attending Auburn University or Southern Union where she is seeking a Degree in Nursing. Scarlett is the daughter of Pamela Wilson, Billing Clerk for Chilton Water Authority in Chilton County. Scarlett is a 2018 graduate from Chilton County High School with a 4.0 GPA. Scarlett will be attending University of Montevallo where she is seeking a Degree in Theater. Griffin is the son of Dennis Howard, Water Superintendent for Jackson Water & Sewer Board in Clarke County. Griffin is a 2018 graduate from Jackson High School with a 4.0 GPA. Griffin is planning to attend University of Alabama on the pre-med track pursuing a Biology Degree. Keri is the daughter of Jamey Sullivan, Operator for the Jackson Water & Sewer Board in Clarke County. Keri is a 2018 graduate from Jackson High School with a 4.0 GPA. Keri is planning to attend Auburn University and pursue a Degree in Chemical Engineering. Kaylee is the daughter of David Fry, Assistant Superintendent of the Southside Water Works in Etowah County. Kaylee is a 2017 graduate from Southside High School with a 4.0 GPA. Kaylee is planning to attend Northwest Shoals Community College where she is pursuing a Science Degree. Brett is the son of Billy Roberts, Meter Reader for the Whorton Bend Water Authority in Etowah County. Brett is a 2017 graduate from Hokes Bluff High School with a 3.7 GPA. Brett is planning to attend Gadsden State where he is pursuing a Degree in Water Science. Leah is the daughter of Matt Benefield, Lineville Water & Sewer Board in Clay County. Leah is a 2017 graduate from Central High School of Clay County with a 4.0 GPA. Leah will be attending Troy University where she is seeking a Degree in Accounting. Mary is the daughter of Ashley Drake, Utility Clerk/Assistant City Clerk for Linden Utilities Board in Marengo County. Mary is a 2017 graduate from Marengo Academy with a 4.0 GPA. Mary will be attending University of Alabama where she is seeking a Degree in Marketing. Braden is the son of Timothy Manuel, Wastewater Manager for City of Fairhope Public Works in Baldwin County. Braden is a 2017 graduate from Fairhope High School with a 4.0 GPA. Braden is planning to attend Faulkner State Community College and pursue a Health Science. Cameron is the son of Ralph Morris, Water Operator for the Washington County Water Authority in Washington County. Cameron is a 2017 graduate from Washington County High School 4.0 GPA. Cameron is planning to attend University of Alabama and pursue a Degree in Surveying/Geomatics. Kaitlin is the daughter of Jeffrey Burks, Water Operator of the Red Bay Water Works & Gas Board in Franklin County. Kaitlin is a 2016 graduate from Red Bay High School with a 3.9 GPA. Kaitlin is planning to attend Northwest Shoals Community College where she is pursuing a Degree in Nursing. Kevin is the son of Kevin D. Twilley, Assistant Superintendent for the East Cullman Water System, Inc. in Cullman County. Kevin is currently attending Wallace State Community College in Hanceville, AL and plans to transfer to Auburn and major in Environmental Science with a concentration in Wildlife Management. Charli is the daughter of Bobby Hood, Jr., Water Operator for Greenville Water Works & Sewer Board in Butler County. Charli is a 2016 graduate from Fort Dale Academy with a 4.0 GPA. Charli will be attending University of Alabama at Birmingham where she is seeking a Degree in Biomedical Sciences. Jeffery is employed with the City of LaFayette as the Superintendent located in Chambers County. Jeffery is planning to receive a Water Operator Certification Grade IV through the Alabama Rural Water Association Operator Certification Program. Sydney is the daughter of Timothy Lee, Water/Wastewater Operator for South Alabama Utilities in Mobile County. Sydney is a 2016 graduate from Citronelle High School with a 3.9 GPA. Sydney is planning to attend Faulkner State Community College and pursue a Degree in Secondary Education. Parker is the son of Pamela Lynch, Accounting Specialist for the Alabama Rural Water Association in Montgomery. Parker is a 2016 graduate from Loveless Academic Magnet Program High School with a 3.9 GPA. Parker is planning to attend University of Alabama and pursue a Degree in Mechanical Engineering. Mary is the daughter of Jimmy Green, Jr., Operations Manager of the Scottsboro Water, Sewer & Gas Board in Jackson County. Mary is a 2015 graduate from Scottsboro High School with a 3.7 GPA. Mary is attending the University of North Alabama where she is pursuing an Elementary Education. Keylee is the daughter of Stewart Ozbirn, Water and Gas Technician of the City of Red Bay Water Works & Gas Board in Franklin County. Keylee is currently attending University of Alabama at Birmingham pursuing a Degree in Health Care Management and Occupational Therapy. Hunter is the son of Shelia Baldwin, Office Manager of the Randolph County Water Authority in Randolph County. Hunter is a 2015 graduate from Woodland High School with a 4.0 GPA. Hunter will be attending Southern Union State Community College where he is seeking an Associate Degree in Science then he will be pursuing a Degree in Engineering. Lauren is the daughter of Penny Guy, Office Manager for Fayetteville Water Authority in Talladega County. Lauren is a 2015 graduate from Fayetteville High School with a 4.0 GPA. Lauren is planning to attend Auburn University at Montgomery and pursue a Degree in Nursing. Shayla is the daughter of Stephanie Benison, CSR/DataControl/Administrator Assistance for Phenix City Utilities in Russell County. Shayla is a 2015 graduate from Central High School with a 4.0 GPA. Shayla is planning to attend Tuskegee University and pursue a Degree in Accounting. John is the son of Paul Thomas, Manager of Jackson Water and Sewer Department in Clarke County. John is a 2015 graduate from Jackson High School with a 4.0 GPA. John is planning to attend University of South Alabama and pursue a Degree in Computer Science. Zachary is the son of Darlene Dutton, Water Clerk of the Town Creek Water Department in Lawrence County. Zachary is a 2014 graduate from Hatton High School with a 4.0 GPA. Zachary is planning to attend University of Alabama where he is pursuing an Economics/Finance Degree. Rachel is the daughter of Nathan Finley, Manager of the Hanceville Water Works and Sewer Board in Cullman County. Rachel is a 2014 graduate from Holly Pond High School with a 4.0 GPA. She is planning to pursue a Degree in Elementary Education from Wallace State Community College. Brittney is the daughter of Evelyn Finn, Office Manager/Bookkeeper of the Sterrett-Vandiver Water System in Shelby County. Brittney is a 2014 graduate from Vincent Middle High School with a 4.0 GPA. Brittney will be attending University of Montevallo. She is seeking a Degree in English. Payton is the daughter of Willette Wallace, Office Manager for Elmore Water and Sewer Authority in Elmore County. Payton is a 2014 graduate from Billingsley High School with a 4.0 GPA. Payton is planning to attend Troy University and pursue a Degree in Exercise Science. Brittany is the daughter of Shane Cook, Operator for Town of Red Level Water in Covington County. Brittany is a 2014 graduate from Red Level High School with a 4.0 GPA. Brittany is planning to attend L.B.W. Community College and pursue a Degree in Accounting. Raymond is employed with the Town of Frisco City Water Works for three years as a Field Worker located in Monroe County. 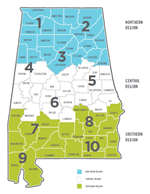 Raymond is planning to receive a Grade II Water and Grade IC Wastewater Certification through the Alabama Rural Water Association. Lindsey is the daughter of Drew Aldridge, Accountant of the Sheffield Utilities in Colbert County. Lindsey graduated from Covenant Christian School with a 4.0 GPA in 2010. Since that time Lindsey has attended Auburn University where she is pursuing an Mathematics Education Degree. Kristin is the daughter of Jeff Spillers, Operator of the West Lauderdale Water Authority in Lauderdale County. Kristin is a 2013 graduate from Central High School with a 4.0 GPA. She is planning to pursue a Degree in Biological Sciences at Auburn University. Willie is employed with the Millbrook Utility System as a Operator Lab Tech located in Elmore County. Willie is planning to receive a Wastewater Certification Grade IV through the Alabama Rural Water Association Operator Certification Program. Ashley is the daughter of J. R. Jones, Chairman for Ray Community Water Authority in Coosa County. Ashley is a 2013 graduate from Central High School with a 4.0 GPA. Ashley is attending Central Alabama Community College in Alexander City where she is seeking a Degree in Nursing. Daniel is the son of Rickey Harrison. Rickey is the Operator for North Clarke Water Authority in Clarke County. Daniel is a 2013 graduate from Clarke Prep School with a 3.5 GPA. Daniel is planning to attend Troy University and pursue a Degree in Naval Architecture & Marine Engineering. Samantha is the daughter of Clifford Johnson General Manager of the Gulf Shores Utilities Board in Baldwin County. Samantha is a 2013 graduate from Foley High School with a 4.0 GPA. She is planning to attend Santa Fe College and purse a Degree in Zoology. with a 4.0 GPA in 2010. Since that time Justina has attended Snead State Community College where she will graduate in May with an Associate Degree in Science and then she will be pursuing an Bachelor of Chemistry Degree. Teri is the daughter of Phoebe Walton, Office Manager of the Oakman Water Works in Walker County. Teri is a 2011 graduate from Oakman High School with a 3.5 GPA. She is planning to pursue a Degree in Accounting at the University of Montevallo. Ann is employed with the City of Lafayette as a Water Operator Trainee located in Chambers County. Ann is planning to receive a Water Certification Grade IV through the Alabama Rural Water Association Operator Certification Program. Whitney is the daughter of Vickie Watkins, Office Manager/Certified Operator for Wall Street Water Authority in Tallapoosa County. Whitney is a 2010 graduate from Reeltown High School with a 3.6 GPA. Whitney is attending Central Alabama Community College in Alexander City where she is seeking a Degree in Agriculture Education. Joshua is the son of Donna Lewis. Donna is the Wastewater Operations Manager for the Andalusia Utilities Board in Covington County. Joshua is a 2012 graduate from Pleasant Home School with a 3.8 GPA. Joshua is planning to attend Troy University and pursue a Degree in Computer Science/Pre-Engineering. Shelby is the daughter of Melissa Lawrence Clerk/ Treasurer of the Town of Loxley in Baldwin County. Shelby is a 2012 graduate from Robertsdale High School with a 3.7 GPA. She is planning to attend Faulkner State Community College and purse a Degree in Nursing. Lindsey is the daughter of Drew Aldridge, Accountant of the Sheffield Utilities in Colbert County. Lindsey graduated from Covenant Christian School with a 4.0 GPA in 2010. Since that time Lindsey has attended Auburn University where she is pursuing an Math Education Degree. Nicholas is the son of Donna Ellison, Office Manager of the Tuscumbia Utilities in Colbert County. Nicholas is a 2011 graduate from Deshler High School with a 4.0 GPA. He is planning to pursue a Degree in Chemistry/Pharmacy at Auburn University. Destiny is the daughter of Judy Caldwell, Customer Service Representative for Tuskegee Utilities Board in Macon County. Destiny is a 2011 graduate from Booker T. Washington High School with a 4.0 GPA. She is planning to pursue a Degree in Chemical Engineering with Environmental Concentration at Tuskegee University. Candra is the daughter of Joann Shockley, Office Manager for Pelham Water Works in Shelby County. Candra is a 2011 graduate from Thompson High School with a 3.7 GPA. Candra is planning to attend University of Montevallo where she is seeking a Degree in English Education. Joshua is the son of Angela Godwin. Joshua is the Account/Receivable Clerk for the Turnerville Water & FPD in Mobile County. Joshua is a 2011 graduate from Satsuma High School with a 3.6 GPA. Joshua is planning to attend University of Southern Mississippi in Hattiesburg and pursue a Degree in Nursing. Anthony is the son of Anthony Cedric Odom, Sr. Operator/Supervisor of the Town of Pollard in Escambia County. Anthony is a 2011 graduate from Flomaton High School with a 3.8 GPA. He is planning to attend the University of Alabama and pursue a Degree in Engineering. Charlie is the son of Jeffrey Lorance, Meter Reader of the Northeast Morgan County Water Authority in Morgan County. Charlie is a 2010 graduate from Priceville High School with a 4.0 GPA. He is planning to pursue a Degree in Engineering. Marshal is the son of Fred Mason, Chief Accountant of the Sheffield Utilities in Colbert County. Marshal graduated from Sheffield High School with a 3.7 GPA in 2008. Since that time Marshal has attended the University of Alabama where he is pursuing an Accounting Degree. Katie is the daughter of David Davis, Board Member for North Dallas County Water Authority in Dallas County. Katie is a 2010 graduate from Dallas County High School with a 4.0 GPA. She is planning to pursue a Degree in Communication Studies at the Wallace Community College. Nicole is the daughter of Sherry Smith, Accounts Payable/Payroll Clerk for Chilton Water Authority in Chilton County. Nicole is a 2010 graduate from Isabella High School with a 3.7 GPA. Nicole is planning to attend Troy State in Montgomery, AL where she is seeking an Accounting Degree. Brittany is the daughter of Brenda Huckaba. Brenda is the Assistant Office Manager for the Greenville Water Works & Sewer Board in Butler County. Brittany is a 2010 graduate from Fort Dale Academy with a 4.0 GPA. Brittany is planning to attend Auburn University and pursue a Degree in Medical Technology. Ryan is the son of Jerry Richards, Plant Operator of the Town of Clayton Water & Sewer Board in Barbour County. Ryan graduated from Dothan High School in 2006 with a 4.0 GPA. Ryan is attending Troy University and pursuing a Degree in Comprehensive General Science Education. Christopher is the son of Pam Leslie, Clerk of the Garden City Water Department in Cullman County. Christopher also works in the Maintenance Department for Garden City. Having graduated from Hanceville High School with a 4.0 GPA in 2007, Christopher is currently attending the University of Alabama where he is pursuing a Degree in Civil/Environmental Engineering and maintaining a 3.75 College GPA. Meagan is the daughter of Curtis Hester, Manager/Operator of the Cherokee Water & Gas Department in Colbert County. Meagan graduated from Colbert Heights School with a 4.0 GPA in 2004. Since that time she has attended Auburn University and has completed her matriculation in the Doctor of Pharmacy professional program and is now attending James I. Harrison School of Pharmacy at Auburn University to complete her degree. Christopher is the son of Chris M. Bowar, Operator for Wetumpka Water Works & Sewer Board in Elmore County. Christopher is a 2009 graduate from Edgewood Academy with a 4.0 GPA. He is planning to pursue a Bachelor of Science Degree at the University of Alabama in Tuscaloosa. Charles is the son of Charles Sims IV, General Manager for North Dallas Water Authority in Dallas County. Charles is a 2009 graduate of John T. Morgan Academy with a 2.8 GPA. He is planning to pursue a Degree in Environmental Engineering at the Wallace Community College. Erica is a 2009 graduate from Satsuma High School in Mobile County with a 4.0 GPA. She is currently employed with the Satsuma Water and Sewer Board. She is planning to pursue a Degree from Lurleen B. Wallace Community College this fall. Sydni is the daughter of Dale Renfroe, a Technician for Russell County Water Authority in Russell County. Sydni is a 2009 graduate of Russell County High School with a 4.0 GPA. She is planning to pursue a Degree in Elementary Education. Meagan is the daughter of Curtis Hester, Manager/Operator of the Cherokee Water & Gas Department in Colbert County. Meagan graduated from Colbert Heights School with a 4.0 GPA in 2004. Since that time she has attended Auburn University and is now attending Auburn University Harrison School of Pharmacy to complete her degree. Christopher is the son of Pam Leslie, Clerk of the Garden City Water Department in Cullman County. Christopher also works in the Maintenance Department for Garden City. Having graduated from Hanceville High School with a 4.0 GPA in 2007, Christopher is currently attending the University of Alabama where he is pursuing a Degree in Civil/Environmental Engineering. Charisma is the daughter of Judy Caldwell, Clerk for Tuskegee Utilities Board in Macon County. Charisma is a 2008 graduate from Booker T. Washington High School with a 4.0 GPA. She is planning to pursue a Degree in Biology/Chemistry at the Tuskegee University. Courtney is the daughter of Chris Taylor, Manager for Jackson’s Gap Water Authority in Tallapoosa County. Courtney is a 2008 graduate from Dadeville High School with a 3.7 GPA. Courtney is planning to attend Central Alabama Community College where she is seeking a Pharmacy or Civil Engineering Degree. Robert is the son of Susan Savage, Clerk of the Jackson Water & Sewer Board in Clarke County. Robert graduated from Jackson High School with a 3.0 GPA. Robert is planning to attend the University of Alabama and pursue a Degree in Accounting. Jeremy is the son of Brenda Huckaba. Brenda is the Assistant Office Manager for the Greenville Water Works & Sewer Board in Butler County. Jeremy graduated in May 2008 from Fort Dale Academy with a 4.0 GPA. Jeremy is planning to attend Troy University and pursue a Degree in Geomatics/Pre-Engineering. Christopher Leslie is the son of Pam Leslie, Clerk of the Garden City Water Department in Cullman County. Christopher graduated from Hanceville High School on a 4.0 GPA Scale. He is planning to attend the University of Alabama and pursue a Degree in Civil Engineering. Andrew Campbell is employed by the Wolf Creek Water, Sewer & FPA as a Meter Reader in St. Clair County. Andrew graduated from Bible Methodist Christian School on a 4.0 GPA Scale. Andrew plans to attend Jefferson State Community College and pursue a Degree in Business. Micah Junior is the son of Barry Junior, Superintendent for Anniston Water Works & Sewer Board in Calhoun County. Micah graduated from Walter Wellborn High School in May, 2005 with a 4.0 and is currently enrolled at the University of Alabama where he is seeking a Biological Science Degree. Tiffany O'Dell is the daughter of James O'Dell, Maintenance Technician for Anniston Water Works & Sewer Board in Calhoun County. Tiffany graduated from Oxford High School in May, 2005 with a 4.0 and is currently enrolled at Jacksonville State University where she is seeking a Biochemical Engineering/Molecular Biology Degree. Kristy Hughes is the daughter of Lynn Hughes. Lynn serves on the Board for the Florala Water Works & Sewer Board in Covington County. Kristy graduated from Florala High School on a 3.0 GPA Scale. Charles Norris is the son of Michael Norris, Operator of the Fulton Utilities in Clarke County. Charles graduated from Clarke Prep School on a 3.0 GPA Scale. Charles is planning to attend the University of South Alabama and pursue a Degree in Graphic Design. Brett is the son of Mark Bohlin, General Manager of the Perdido Bay Water, Sewer & FPD. Brett will be graduating from Foley High School. Brett is planning to attend Faulkner State University and pursue a Degree in Business. Katelynd is the daughter of Bruce Branum, Superintendent for the Greenville Water Works Board. Katelynd will be graduating from Fort Dale Academy. Katelynd is planning to pursue a Degree in Nursing at the University of Mobile. Brandy is the daughter of Rhonda Faulkner, Assistant Water Board Clerk for the Water Works & Sewer Board of Ashland. Brandy plans to continue her education at Jacksonville State University where she is seeking an Accounting Degree. Morgan is the daughter of Barry Hill, Plant Manager for the Upper Bear Creek Water Plant. Morgan will be graduating from Haleyville High School and plans to attend Auburn University this Fall. Micah is the son of Barry Junior, Superintendent for Anniston Water Works & Sewer Board. Micah is a graduate of Walter Wellborn High School and is currently enrolled at the University of Alabama where he is seeking a Biological Science Degree. Tiffany is the daughter of James ODell, Maintenance Technician for Anniston Water Works & Sewer Board. Tiffany is a graduate of Oxford High School and is currently enrolled at Jacksonville State University where she is seeking a Biochemical Engineering/Molecular Biology Degree. Andrea is the daughter of Sherry Richey, Clerk for the Littleville Water Works. Andrea will be graduating from Russellville High School and plans to attend the University of Alabama to seek an English Degree. Brittany is the daughter of Andrea Stockton, CSR with the Central Elmore Water & Sewer Authority. Brittany will be graduating from Wetumpka High School and plans to attend Auburn University. Amanda is the stepdaughter of Timothy Christopher, Superintendent for the Ohatchee Water Authority. Amanda recently graduated from Jacksonville High School and plans to attend Jacksonville State University to seek a Biology Degree. Sabrina is the daughter of Shay Clark, Clerk for the Hamilton Water & Wastewater Department. Sabrina recently graduated from Hamilton High School, but has not made a choice as to which University to attend her major will be Environmental Science. Brandy is the daughter of Rhonda Faulkner, Assistant Water Board Clerk for the Water Works and Sewer Board of Ashland. Brandy plans to continue her education at Jacksonville State University where she is seeking a Accounting Degree. Jacob is the son of Theresa Jean Hamby, Clerk for the Beauregard Water Authority. Jacob recently graduated from Beauregard High School, where he was a member of the Honor Society and Student Council. Meagan is the daughter of Steve Jackson, Manager Quint-Mar Water Authority. Meagan recently graduated from Highland Home School. She was a member of the Mu Alpha Theta Math Honor Society, she plans to enroll in advanced education in the Fall. Jordan is the son of Pearl Stallworth, Bookkeeper City of Evergreen. Jordan recently graduated from Hillcrest High School, where he was a member of the Student Government Association, Marching band and participated with many community service programs. Jeremy is the son of David Ellis, Manager of the Fort Mitchell Water System in Russell County. Jeremy graduated from Glenwood High School in May and plans to attend Chattahoochee Community College to seek a Business Administration Degree. Jennifer is the daughter of Joel Henderson Wastewater Operator with the City of Eutaw. Jennifer plans to continue her education at the University of Alabama where she is seeking a Civil Environmental Engineering Degree. Charles is the son of Fred Mason, Chief Accountant for the Sheffield Utilities. Charles graduated recently from Sheffield High School and plans to attend college at the University of Alabama.